Sign a pink hat love letter to the Netherlands if you live here! They marched in the Women’s March on January 21, 2017 against hate and for inclusion. Now Carrie Ballard and Hugo Skoppek are spearheading an open letter to the Netherlands. We are all people who live in the Netherlands. We are normal people; your neighbours. Some of us are foreigners, and some of us are Dutch. We all care about the Netherlands. The United States woke up to the election of Donald J. Trump only a few weeks ago. Many people were shocked. His campaign appealed to Americans who have been left behind by the modern economy, feel cheated out of their right to a good future, the white middle class whose views were not understood or addressed, and who feel they are looked down on by a supposed élite. Are they racist? No, but they witness minorities getting ahead of them and when the people are of a different color or religion it is easy to direct anger and fear at them. The supporters of the current US president thought that voting anti-status quo and exclusion (the ‘Muslim ban’) would make the future better for them. In reality they are getting laws that they did not vote for that is shifting the character of the country. We ask the people of the Netherlands to do better than the USA did in the election this year. 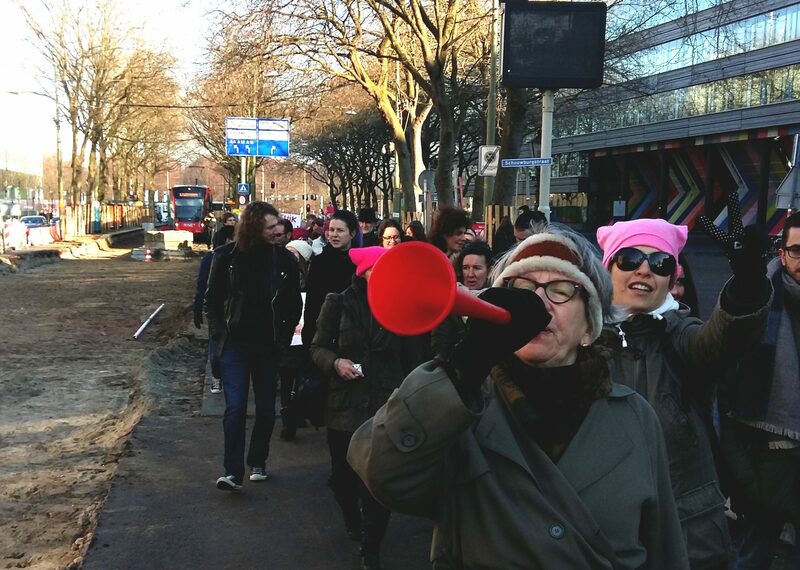 In the Netherlands, there are peaceful demonstrations of thousands of ordinary people, many women and children, against Trump and against hate here in the Netherlands. People of goodwill want change too, but not at the expense of going backward in social progress and having more and more stress and division in the society. Fear and prejudice will do nothing but harm to all of us. We believe the Netherlands can find other, better solutions to the differences between those who live here and those who are coming, solutions in line with Dutch values of openness and respect, of fairness, of doe normaal and respectful behavior. We can live together if we accept some things about each other. Dutch culture has norms and values, like all cultures. If we live here, we must respect them in our daily behavior. And for The Other? Can we benefit from the things other cultures can contribute? Culture, work, food, music, learning, piety? We want to reach out to each other. We want to make peace with The Other and within our own thoughts. We would like to join together to do our part to keep the Netherlands, our home, a country of inclusion, solidarity, values, fairness for all people of goodwill. Please join us. It may be that we like somebody who is bad for us or that we hate somebody who is good for us, but let us not forget to do unto others as we would have them do unto us. Let us focus on the things that make the Dutch so proud to be Dutch and foreigners so admiring about this country. Say ‘No’ to hate and division, and ‘Yes’ to democracy that works well, a clean and safe environment, a fair economy, respect for citizens, and a good future for our children.